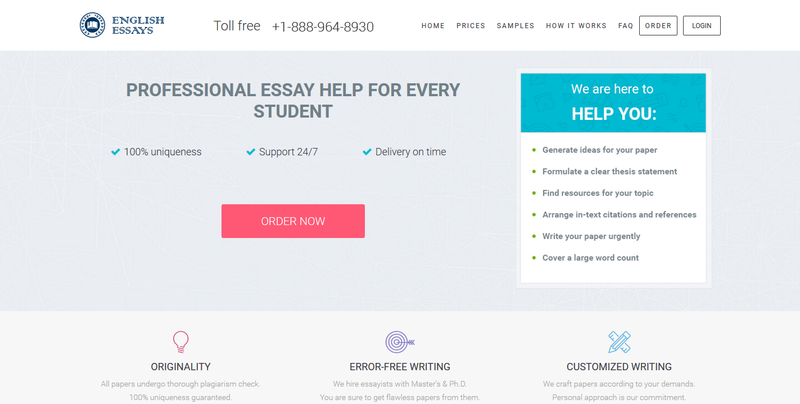 Okay – when you pay for an assignment on a site such as englishessays.net, you expect them to be written by excellent writers. While the product I received scratched off the grammar and sentence structure checkbox, I found the piece itself to be lacking research as well as an exciting tone. Now, my main reasoning for giving this section such a low rating – my grade was affected by this! My professor noted the lack of decent sourcing, amongst other things. This was a large term paper and played a significant role in my final grade. If getting the subpar assignment back was stressful, navigating the site was like a migraine. While they claim to have a variety of services that cater to the needs of academic writers I found it quite hard to even find the service I wanted. Once I finally managed to get through the lack of the site’s organization, I ended up having to create an account. Once I created an account I STILL had problems getting setup with the site’s services. I even put a message in a chat feature (which never got responded to). I’ll get more detailed on that shortcoming in a second. I gave this section the rating I did because of one primary thing: they didn’t respond to my chat initially when I first was getting my account set up. Once they did respond, however, I did find them to be quite helpful. They were polite when it came to answering my questions, and even responding to some of the more complex ones I asked with an air of confidence that seemed, well, unnerving. Turns out that they were too confident, however; they talked up a service that really isn’t all that great. The paper was delivered to me on time. What more can you ask for? Actually, the writer on englishessay.net delivered the paper to me ahead of time. If he hadn’t, however, he would’ve cost me a much lower grade than the one I received. I had to do a ton of additional research that was required for the paper to be satisfactorily completed. While the paper was given to me early, it doesn’t mask the fact that I had to do a day’s worth of additional research just to fit the requirements of the assignment. My experience on englishessay.net wasn’t the best (could you tell?) and because of that, I subsequently gave it a poor review overall. I can’t help but think about how my entire experience would’ve been different if my paper had been adequately researched to where it was suitable for me to turn into my professor. If that was the case, this review would be much more positive. I doubt I’ll come to this site again for similar services unless I know exactly what I’m getting into.